Attach the clip to install the protector. 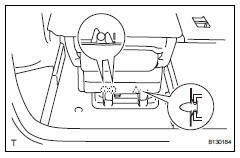 Place the seat onto the lock striker. Fully lock the seat to the lock striker. Lock the rear side, then lock the front side. Confirm that the seat is firmly locked to the lock striker. Install the rear no. 2 Seat link with the 2 nuts. 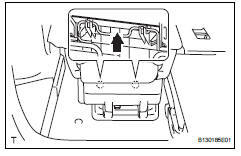 Install the seat to the rear no. 2 Seat link with the 2 bolts. 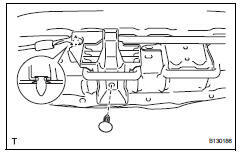 Pass the rear seat cushion wire underneath the rear no. 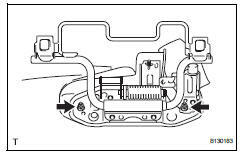 2 Seat link part labeled a. 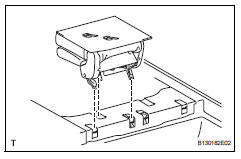 If the wire is not installed as described, the seat will not move properly. 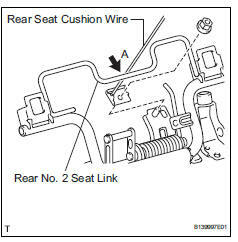 Install the rear seat cushion wire to the rear no. 2 Seat link with the nut. 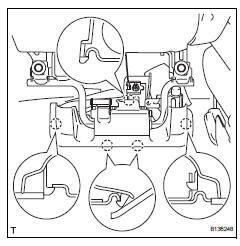 Attach the 5 claws to install the leg cover. 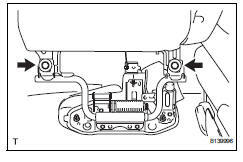 Push the hinge cover in the direction indicated by the arrow in the illustration to attach the 2 claws. Attach the 2 claws and clip to install the hinge cover. Return the seatback to the upright position.